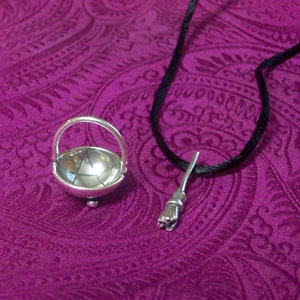 These miniatures can double as tiny altar objects as well as jewelry. Peek in the cauldron and you'll find a perfectly inscribed pentacle. A black satin cord is included with each item, unless you specify "earring". Although the broom is longer than the cauldron they look nice together. Sometimes I wear them both on one side.